There’s a LOT more money floating out there in the United States (as well as in the rest of the world) than what is captured and quantified by the existing monetary measurements of the Federal Reserve (and other central banks). I call the real money and assets not measured by the Federal Reserve the “Second Economy.” Here I will focus on the United States, though the same logic may be applied to any other country which has a robust central banking system. 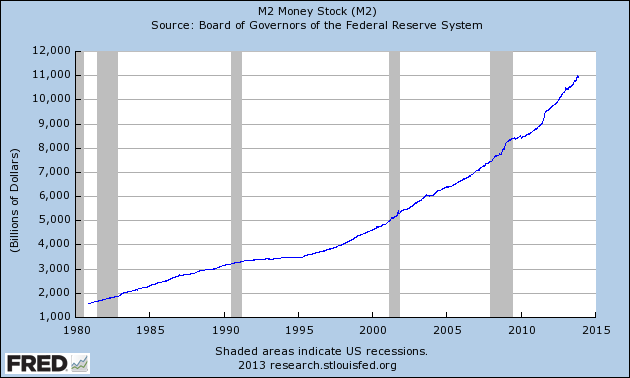 Next let’s look at a chart which shows the actual money supply (money stock) as defined and computed by the Fed, which shows that the US money supply is now $11 trillion (11,000 billion). Our monetary policy is generally based on the above measures of money supply provided by the Fed. It is clear from the above definitions that the money counting done by the Fed, while accurate, captures only a small part of the total amount of money and other hard value circulating and in play in the economy. So, the Fed’s definition of the money supply does NOT include such really huge items as the value of corporate stocks and bonds; the value of the housing stock and commercial real estate; and foreign deposits owned by American companies and individuals. It also does not include large deposits and non-liquid investments in banks and other types of entities such as hedge funds and partnerships; and derivatives, mortgage and auto and business loans outstanding; nor does it include commodities, student loans, and credit card loans. Remember that all loans are assets on someone’s balance sheet. The Fed also does not count the national debt or other funds managed by the Federal Reserve, nor does it include the value of small businesses or insurance company and private bank reserves. This “second economy,” consisting of real cash and real value assets not captured by the Fed, amounts to about $180 trillion dollars, according to Reagan economic advisor and well-known financial analyst Dr. John Rutledge, http://rutledgecapital.com/2009/05/24/total-assets-of-the-us-economy-188-trillion-134xgdp/ . His chart below is taken from his 2009 analysis of obscure Federal Reserve Board statistics at http://www.federalreserve.gov/releases/z1/Current/ . This chart includes all assets owned by US citizens or companies or the US government, wherever located in the world. The notation $187,813 ($billions) in the summary block at the lower right should be read as $187 trillion dollars. Thus the total cash money supply and other hard value attributable to the United States is about $187 trillion, and only $11 trillion of this value is used to generate federal monetary policy. The rest of this money is just out there, the second economy. This $187 trillion is a truly fabulous amount of very real money, far more than ever before in the history of the world. And as you can see from the chart above, the amount of Fed computed money in the economy now, $11 trillion, has grown by almost geometrical proportions since 1980. The amount of money in the second economy has grown likewise. So in the last 33 years the total amount of money in the economy has grown by an amount probably greater than the combined total amount of money available in the US from 1776 up until 1980. This tremendous increase in the number of dollars and hard value stacked up in the private sector cannot properly be called inflation. “Inflation” is a rigidly defined economic term which describes increases in the cost of living for consumers and a decrease in the value of the dollar; and is usually indexed by the Consumer Price Index (CPI).There is no evidence that the huge accretion of dollars and hard value has in any way reduced the purchasing power of the dollar, as is required for inflation. Inflation has been controlled very well during this whole period of growth in real money between 1980 and the present. Yet there are trillions of additional dollars floating around in the pockets of the wealthy and in the banks, the “second economy.” This increase in money floating around is not limited to the United States, yet the US has easily led the pack in the gigantic increase. What are the implications of this almost geometric growth since 1980 in the money supply and amount of real hard value actually available in the United States (and to a lesser extent in other countries)? Obviously the monetary policies of the last 33 years have been working dramatically well, far beyond the imagination of most of us. The creation of wealth abounds in every area of our national life, and must be considered as a great boon to mankind. There are a many prophets of doom and Armageddon who think we can’t continue to exist and that this new wealth will ultimately destroy us. I’m not one of those. It’s easy to project that the next hundred years may bring a renaissance of life and ease that’s just as formidable as the changes of the last two hundred years. Table 4: Share of wealth held by the Bottom 99% and Top 1% in the United States, 1922-2010. Professor Domhoff’s chart shows that there has been very little change since 1922 in the percentage share of wealth in the United States which is owned by the top 1% of the population. This evidence is quite reassuring. We have become the great nation we are today without altering the relative ownership shares of the economy over the last hundred years. Another of Professor Domhoff’s charts shows a negative trend which is not totally out of control yet needs to be addressed. Since 1983 the share of the economy owned by the bottom 80 percent has declined from 18.7% to 11.1%. This is one of the reasons the 280,000,000 in the bottom 80 percent of the population are currently feeling the stress of financial insecurity. The chart shows that most of the percentage shift in resources has gone not to the top 1%, but to the next 19%. So, about 66,500,000 people in the top 19% just below the top 1% are benefitting at the expense of the bottom 80% of the population. As I said, this is not a huge shift, yet it is a significant shift which can lead to growing anger and desperation among the 280,000,000 in the bottom 80 percent of the population. It seems fair to say that even at the present time the US Congress is dominated by those individuals and corporations who have the most money, namely the owners of the second economy. This wasn’t quite so definite a problem in 1980. We now have trouble raising taxes, reducing the national debt, providing health benefits to citizens, and increasing the minimum wage. Even plans to increase public works to address joblessness run into severe headwinds. The second economy placeholders, the top 20%, don’t want to lose even one of the trillions of dollars they own. It’s interesting…. When you own more than, say, a hundred million dollars, about the only things you can buy with the money are (1) influence, and (2) more of the same things you already have. Well, actually, there are a lot of other things you could buy or invest in which would be beneficial to the population as a whole. Yet most of the owners of this money don’t seem to have the imagination or motivation to take risks to fund projects such as new drug research or massive irrigation schemes, or the search for non-incremental low-probability and high-impact events such as a totally new source of clean energy (investors seem to love windmills, even with their Sancho Panza aspect and low output). We have actually not made much significant progress in science or technology so far in the twenty-first century, or even in the last half of the twentieth century. Most of our “new” products are actually just improved versions of items invented in the nineteenth and early twentieth centuries. For example, the telephone in 1876, the light bulb and electrical power plants in 1880-1900, the automobile in 1901, the airplane in 1903, the television in 1929, and the computer in 1949. Add your own non-incremental events to the list. More than a hundred of those in the top 1% of the second economy have pledged to give at least half their assets to charity at their deaths. This is not a good idea. The non-profit sector is by definition not capitalistic (profit-making) in nature, and these resources will be permanently removed from the private sector economy. See my articles at https://mcgeepost.com/2013/06/17/philanthropy-no-longer-the-answer-part-one/ through part five. One thing the second economy could do is become more willing to pay their taxes, and stop fighting every single proposal to raise taxes. Yes, we want a smaller government. Yet if our government gets so small it collapses, then there will be no structure available to sustain the second economy, or any economy. If our government gets so deeply in debt that it cannot recover, all of us from top to bottom will suffer the consequences. Do the owners of the second economy actually believe that they can continue do what they do and own what they have without a strong enough government to preserve stability throughout the land, and maintain relations with our international rivals? Such vicious antipathy for our government is sheer madness. We definitely need to pay down the national debt to a much more manageable level. See my article at https://mcgeepost.com/2013/11/18/bush-43s-biggest-mistake/ for a discussion of the need for a temporary (maybe ten years) highly progressive tax increase up to maybe 70 per cent, with a highly progressive surtax on top of that for maybe less than ten years. Changes in the wage-hour laws can also help. I will be writing about the needed changes in the future. Given the nature of the present income and asset inequality in the United States, those who advocate some redistribution of this wealth are certainly not socialists. As I hope I have demonstrated, the degree of inequality in the US is not nearly far enough out of line to change our democratic and capitalistic system! Spending money to build state of the art factories inside the United States to produce clothing and electronics and other normally imported goods would be a very good use of some second economy money. See my article at https://mcgeepost.com/2012/10/18/dangers-of-our-import-economy/ The factories already in existence in third-world countries could be repurposed to produce goods for sale in those countries. These redistributions will not trigger significant inflation as long as providers of goods and services continue to generate sufficient supplies of products to meet demand. Inflation occurs when demand is greater than supply, not when buyers have more money to spend. In conclusion, there is another form of redistribution of income and assets which we as a nation should pursue. It involves mostly the top 20%, and is based at least in part on the increasing life expectancy of all of us. Congress should eliminate the gift tax entirely for transfers of money within families. A family circle of exemption should include parents, grandparents, spouses, children, stepchildren, grandchildren, brothers and sisters, uncles and aunts, and first cousins. There are a lot of children and other members of wealthy families who grow up in privilege, only to find themselves having to fend for themselves as adults because the government taxes family transfers of money to them. This situation tends to breed dissolute living and a frustrated sense of entitlement. Industries have grown up around developing trusts to avoid gift taxes. Well, I say that these huge numbers of family members are entitled, and as a matter of social policy the government shouldn’t be in the position of withholding wealth from them by law. The transfer of wealth should be entirely a family matter, decided only by the owner of the wealth as he or she sees fit. So you see, the redistribution of wealth is a matter which should be of interest to all of our citizens, not just the poor or the lower 80%. We are all Americans and we should treasure our country and our people, and even the spoiled rich kids among us. Mike, I have just put together some more recent numbers on the total U.S. balance sheet to update the 2008 numbers you show in your post. Total financial assets for all sectors of the US economy were $177.2 trillion at the end of 2012, the most recent detailed data available. In addition, people held $83.7 trillion in tangible assets, like land, houses, and cars. 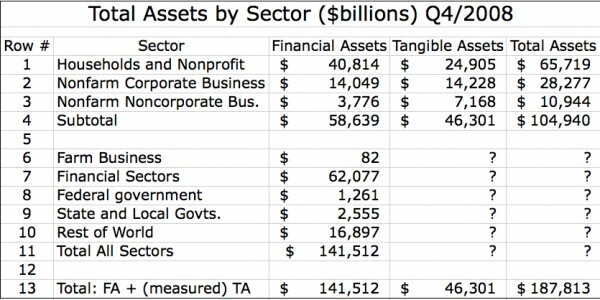 That makes the total of all assets (financial plus tangible) $260.9 trillion. Household net worth at the end of 2012 was $71.2 trillion. The Fed reports balance sheets up to Q3/2013 for some sectors (households, nonfinancial corporate, and nonfinancial non-corporate–basically large and small businesses excluding banks and other financial companies.) Total assets for these reported sectors are up 6.9% over the 2012 numbers because both stock prices and home prices have increased. If you use the 6.9% to make a guess at the missing sectors (banks and governments) you end up with total assets of $278.6 trillion. And remember that when the Fed reports these numbers they do not include the value of any of the land or natural resources owned by federal, state, or local governments or foreign nationals. Since the Federal government owns about 700 million acres of land this is a big deal. Why don’t they report it? Your guess is as good as mine. but good topic. I needs to ѕpend some time learning more or understanԁing moгe.